Fundamental of diagnosis: Ear acupoint detection diagnosis is one of the important parts of traditional Chinese medical theory. Chinese medical theory believed that human ear likes an upside-down fetus. Every organ and part of human body has its corresponded acupoint on ears called ear-acupoints. When the pathologic change incurred in an organ/part of human body, the corresponded acupoint on ear will have the following changes: color changed, form distorted, electric resistance lower, etc. Based on the theory, the apparatus tests tiny changes of biological current and adopts the high-technology to enlarge the electronic and voice wave of it. 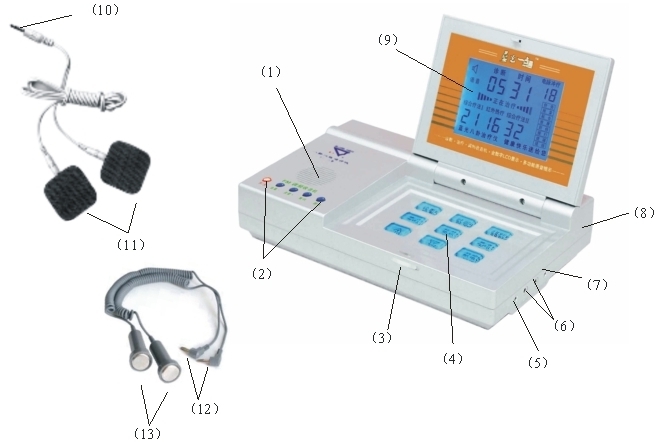 Therefore, the apparatus could help user to detect the potential disease, alarm automatically and treat early. Connect the apparatus with electricity; set the apparatus status as pause. a. Ensure the apparatus and accessories are under good conditions before diagnosis. Insert the Plug of Diagnosis Detector Pen (22) into Jack of Ears-Acupoints Diagnosis (17) on the left side of apparatus; connect Diagnosis Pen Detector (23) with Plug of Detective Ring and Electro-Eardrum (21); press Diagnosis button, then press Up button to add intensity. The apparatus work well if there is alarming accompanied with the intensity increase. b. Wear the Detective Ring (19) on middle finger, and insert Plug of Detective Ring and Electro-Eardrum (21) into jack of ring. c. Regulating the benchmark point. (Refer to the right picture). Press the Diagnosis button, then press Up button continuously until the apparatus alarms slightly. It means the benchmark points found. Explanation: Different people have different electric resistance, so every time the benchmark point must be regulated before diagnosis. Please be careful because the benchmark point can not be too high or too low. If it is too high, untrue positive will be detected, even though there is no illness the apparatus will alarm. If it is too low, the disease cannot be diagnosed. In the above mentioned two situations, the benchmark point should be re-adjusted. Attention: Do not rub ears hardly before diagnosis. a. Use the Diagnosis Detector Pen to detect the acupoints around the region auricularis in turn (refer to right picture), do not ignore any acupoints. b. If the apparatus alarms when the detector pen reaches a certain acupoints, refer to the ear-acupoints diagnosis blueprint, find out the corresponded organ/part of the body that incurred pathologic change. You can also re-confirm the pathologic change in that organ/part through hands-acupoint diagnosis. a. Make the pressure and motion speed of the diagnosis detector pen equal, pressure strength standard is no concave found in the region auricularis, motion speed standard is that you do not stay over 2 seconds in the same ear-acupoints, or fake positive will show (apparatus will alarm even though there is no disease). b. Diagnosis should be done on both sides of ears and hands. Generally speaking, the diseases in left side of human body could be reflected on right ear. The diseases in right side of body could be reflected on left ear. c. While detecting, alarming without pain, it means illness is premature. Alarming with pain feeling means the disease has already formed. d. Do not process the diagnosis if you got drunk, sweating, exciting, fever or just finished a treatment, because it would lead to a wrong diagnosis result. 1. Tumour Diagnosis: If apparatus alarms on the detection of adrenal gland, endocrine, subcortex, tumour catution section 1. 2. 3. and tumour acupoints 1. 2. 3. It means there are some abnormity in the relevant section and should re-confirm it through other medical instruments. 2. Diabetes Diagnosis: alarming on pancreas, endocrine, hungering point or thirsting point means you might get diabetes. 3. Coronary heart disease Diagnosis: alarming on heart, small intestine, blood pressure lowing point or kidney means you might get coronary heart disease. 4. Pregnant Diagnosis: alarming on uterus, pelvic cavity, bladder, incretion or cardiac means you might get pregnant. 5. Other Diagnosis tips: alarming on Shenmen Acupoint means the quality of sound sleep is not good. Alarming on blood pressure depressing acupoint means blood pressure is abnormal. 6. There is some acupoints located on gristle, (such as thoracic vertebra, mammary gland, lumbar spine, sacrovertebral, sciatic nerve, hip, knee, ankle, liver, spleen). Detect them carefully, ensure you correctly regulate the benchmark point, you may lay the detector pen horizontally and vertically to see the diagnosis result. a. Insert the Plug of Diagnosis Pen Detector (22) into the Jack of Hands-Acupoints Diagnosis (18) on the left side of apparatus. b. Choose the suitable Electro Eardrum, insert Plug (21) into it (20) and wear it in the relevant ear. (Refer to the right picture). During the diagnosis, if you wear the Electro Eardrum on the left ear, detect the left hand; otherwise detect the right hand. The acupoint of left and right hands are symmetric. c. Place the Position Fix Clip (24) on the Shaoshang Acupoint of thumb and regulate the basic point. d. Press the Diagnosis Button, then the Up button continuously till you hear the slight spasmodic alarming. e. Hold Diagnosis Pen (23) and slide the detector over the relevant acupoint on hands. (Do not press acupoint to avoid wrong detect result). a. Every time, user should regulate the benchmark point on Shaoshang Acupoint before the comprehensive diagnosis through hand and ear acupoints. b. Refer to the Hand Acupoints Reference Picture, find out the relevant disease reflect point. c. After diagnosis, remove the electro eardrum and diagnosis pen and put them back. a. As the accessories of the apparatus, there is a left Electro-Eardrum and a right one. During diagnosis, please wear left Electro-Eardrum while detect left hand, or right Electro-Eardrum while detect right hand. The acupoints on the two hands are symmetric. Left hand diagnosis result owns priority. b. The clinical report shows, comprehensive diagnosis through hand & ear acupoints can be altered to be comprehensive treatment. The alarming acupoint is the part to be treated. Electro-Eardrum and Diagnosis Pen could be used as treatment instruments. Obvious curative effect could be given to partial pain patient. c. Detect the disease all around the body through left hand. Right hand is bias on the detect of lime, liver and gallstone diseases treatment. d. The latent diseases could be determined in few minutes and treated in advance. e. Clean of the diagnosis tools: Diagnosis Pen, Ring, Position Fix Clip for Shao Shang Acupoint, and Electro-Eardrum should be washed with fresh water after the usage. f. Do not place the Electro-Eardrum and position fix clip for Shao Shang Acupoint with shell or other elastic accessories to avoid senescence. g. Put the accessories back after the treatment. B. Far infrared Heat Treatment—control the temperature of Multifunctional Radiation Treatment Board (26), the initial heat intensity is set at 13, intensity is ranged between 00-21. C. Complex Treatment II –control the intensity of Electrode Slice (11) and Electromagnetism Contactor (13), the initial electric intensity is set at 00, intensity is ranged between 00-32. D. Electrotherapeutics (Eight Functions) –control the intensity of Electrode Slice (11), the initial electric intensity is set at 05; intensity is ranged between 00-32. The above therapy methods A, B, C, D can work separately or simultaneously. As a rule, the initial intensity of diagnosis is set at 05, intensity ranged 00-32; the initial treatment time is at 06 minutes, treatment time ranged 00-32 minutes. Multifunctional Radiation Treating Board: put the Multifunctional radiation Treating Board (26) on the treating points after soaking water, and insert the Plug of Electric Intensity (28) into the Jack of Complex Treatment I (15) and the Plug of Far Infrared Heat Treatment (27) to Jack of far Infrared Heat Treatment (16). Electrode Slice: uncover the elastic of patch and put it on the treatment acupoint. Electromagnetism Contactor: wrap the two Electromagnetism Contactors with 3-tiered gauzes and bind each of them with a piece of elastic, then soak water and insert the two Signal-Output Plugs (12) into the Jack of Electromagnetism Contactor (6). (2) Select Therapy method A: press the Complex Treatment I button, then press the Up or Down button to adjust the output intensity. Select Treatment B: press the Heat Treatment button, then press the Up or Down button to adjust the output temperature. Select Treatment C: press the Complex Treatment II button, then press the Up or Down button to adjust the output intensity. Select Treatment D: press the Audiotherapy button, then press the Up or Down button to adjust the output intensity. All setup will be automatically memorized n 5 seconds after pressing of Up or Down button. (3) Conclusion: when the treatment finished, you’ll hear the voice tip “Treatment finished, thanks for your usage and may you healthy”, then the apparatus would automatically cut off all electricity intensity output, you should switch off the Power, remove the electricity plug and clear up the accessories for next time use. (1) Inset all fitting plugs needed before the treatment, and do not remove them while the treatment is processing, or it might spoil the apparatus performance. (2) Please remove power plug to save electricity after the treatment. Treat with Electro-Eardrum 2 to 3 times every day, and 20 to 30 minutes every time. It will dredge the channels, stimulate the energy of cell, promote the immunity function and natural function and reach the goal of gymnastics and prolonging the life. Soak the Electro-Eardrum with water; treat 2 to 3 time, 20 to 30 minutes every times. It will regulate the incretion, promote the microcirculation and dispel the black pigment. It enables your face fresh and shining with more elasticity. You will reach the goal of cosmetology. FM radio is controlled by four buttons. Press the Restoration Button, receiver set on low FM and do the Search Button, radio searches automatically from low to high frequency. Stop searching when the programmers of receiver become clear. Press +/- to choose the volume. Attention: volume+, volume- and button of power switch are worked separately. All of the following functions: FM receiver, comprehensive diagnosis through hand and ear acupoints, five-method output therapy work separately and could not operate simultaneously. (1) For safety purpose, do not use the apparatus inside cotton bedcover, nor make warm through the multifunctional Radiation Treating Board. (2) The pad on Electrode Slice in Electric intensity I should not be too dry in order to avoid affecting the conductivity. (3) All the channels of body form a circulation upon the touch of the contactor or Electrode Slice. If you feel gentle tumefaction, slight tingle, tremulous in some sensitive acupoints, it means you have got the right acupoints and are curing the disease properly. If you feel uncomfortable tingle or aching, it means that the acupoints might not be correct, you should move the Electrode Slice or Electromagnetism Contactor, find the correct acupoints, and restart the treatment. (4) Do not place the Electrode Slice or Electromagnetism Contactor on any injury skin to avoid current scalding or cross infection. (5) It is normal that you might feel different intensity about the two Electrodes Slices or two Electromagnetism Contactors (Yin&Yang) and would not affect the curative effect. (6) Keep a distance between the two Electrode Slice or Electromagnetism Contactors. Direct touch might cause short circuit, then the biology energy could not enter the human body and diseases could not be cured. Apparatus damaged in this way should be responsible by yourself. (7) Dementia or mental disorder patients could only use the apparatus under the supervision of his family. People got bruise injury or acute wrench should use the apparatus 24 hours later. (8) Patients got coma, pregnant, wearing metal accessory, active bleeding, cardiopulmonary function failure or wearing heart pacemaker are forbidden to use the apparatus. (9) The hood of the Heat Treatment Bag can be removed for washing if it is dirty and used again until dry. (10) Calenture, drying disease, fever patients should not start the heat therapy but use the Electromagnetism Contactor or Electrode Slice in Electric intensity I.